The PVX-4000-2kV is an air-cooled, high voltage bipolar pulse generator. 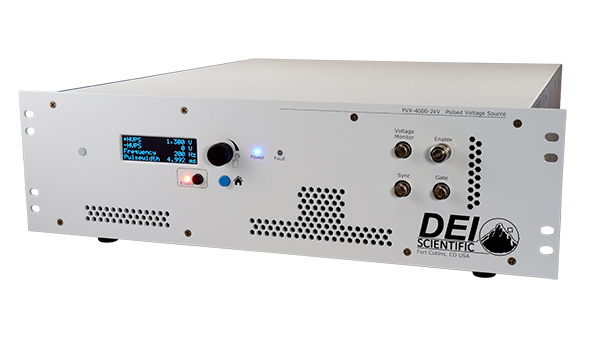 Optimized for driving high impedance capacitive loads at up to ±2000 V, the PVX-4000-2kV is well-suited for driving extraction grids and deflection plates for electrostatic modulation of particle beams in time-of-flight mass spectrometers and accelerators. The output voltage can be set from 0 V to ±2000 V. Duty cycles from 2% to 98% and repetition rates from 40 Hz to 30,000 Hz are supported by the internal trigger source. Pulse widths from 500 ns to DC and repetition rates from single-shot to 100 kHz are supported when an external trigger source is used. 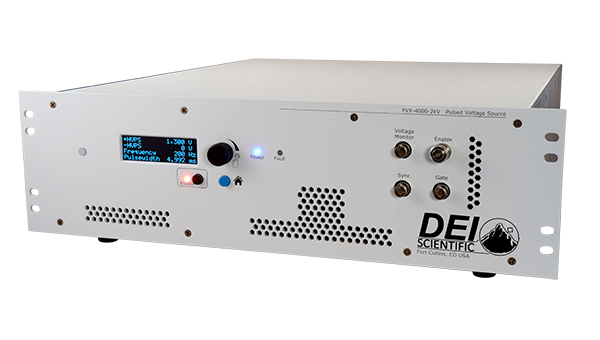 With a built-in trigger source and the internal positive and negative high-voltage DC power supplies, the PVX-4000-2kV can be used as a standalone test system. Programming is done through front panel controls as well as RS-232 and USB computer interfaces. For automated applications, complete control of the instrument is provided through RS-232 and USB computer interfaces. Up to five system configurations may be stored in internal non-volatile memory, providing instant recall of frequently-used configurations. Conveniently-located front panel BNC connectors allow the PVX-4000-2kV to be externally triggered. The system has a Sync output for interconnection to other equipment. The pulse from the Sync output is synchronized to the leading edge of the output voltage pulse. The output voltage waveform can easily be monitored through the Voltage Monitor BNC connection using an oscilloscope set to 1 MΩ termination. 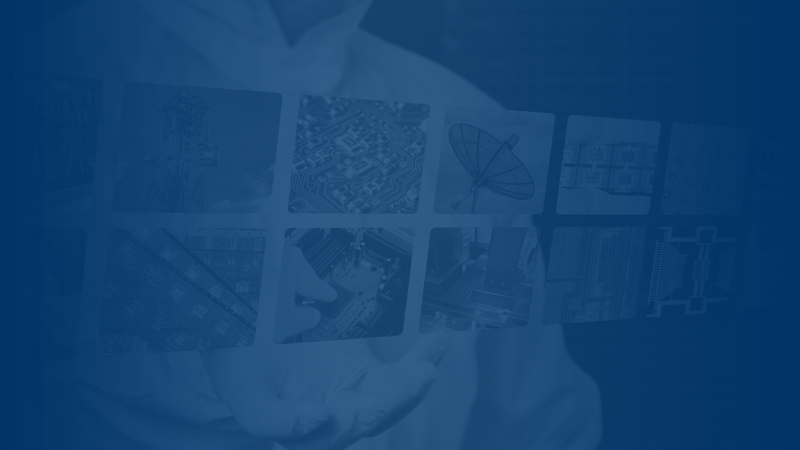 Optimized for high impedance capacitive loads, the PVX-4000-2kV is well-suited for driving extraction grids and deflection plates for electrostatic modulation of particle beams in time-of-flight mass spectrometers and accelerators. Its robust and versatile design also makes it well suited for pulsing or gating power tube grids, Pockels cells and Q Switches, acoustic transducers, microchannel plates, photomultiplier tubes and image intensifiers. 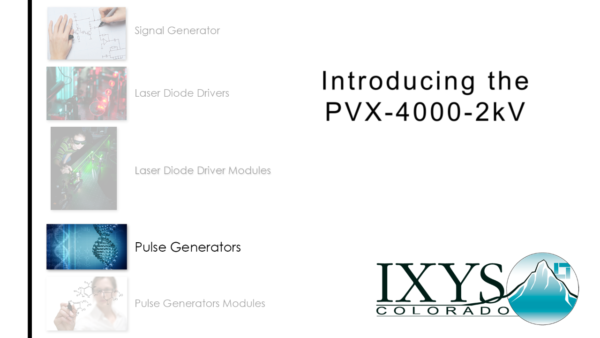 Introducing the PVX-4000-2kV High Voltage Pulse Generator from IXYS Colorado / Directed Energy, Inc.